Taken with Olympus E500 digital camera on March 23rd 2007. Click image for larger view. This photo was taken back in March when there was still lots of snow around. I really love this beach full of millions of small pebble stones. It is very special to walk on it and listen to waves rolling in. The reason I’m posting this photo today is that I was contacted on Flickr about this particular picture. The person contacting me are making a book about “Hurtigruten” (English: Costal Express) in Norway and wanted to use this shot in their book. I’m very excited about this because I have never been printed before! The project is very low budget so all I’m getting from it is a free book and of course my name in it, but the satisfaction of getting printed is payment enough. Huritigruten (or Hurtigruta as we call it in northern Norway) is a passenger and freight line that sails daily along most of of our long coastline. The trip takes 11 days and is very popular among tourists. Very cool photos!! awesome that you getting that in a book! Congratulations! Your photography has been a joy to look at, and I can’t wait until I get to Norway, especially as my wife is part Norwegian! Please let us know when the book is available. congrats! your photos are fabulous…you definitely deserve it! What a beautiful photograph. I am in no way surprised that you got approached about this picture. I’ve also had a look at some of your other photographs, and they are all great. You have talent, and lots of it. Keep it up and who knows, soon you’ll be publishing a whole photo album! Great stuff here!!! I love the stones in the foreground. They add a lot of depth to it. Thanks for sharing the Paradise you live in. very nice. Really amazing landscape there!!!! that is such an awesome photo.. I keep getting my eye drawn to different aspects of it.. i *love* the detail of the pebbles even as the mountain in the background clamors for attention… great eye, and congrats on getting published! That is a beautiful picture. If I had a book, I’d want to put it in mine too! Congratulations on getting the photo chosen for a book. I enjoyed your site – particularly as I am a fellow Cutline theme user. A fantastic view. What a great looking mountain! Congratulations on getting selected for the book. You certainly deserve it with this beautiful shot. I especially like the range of texture. 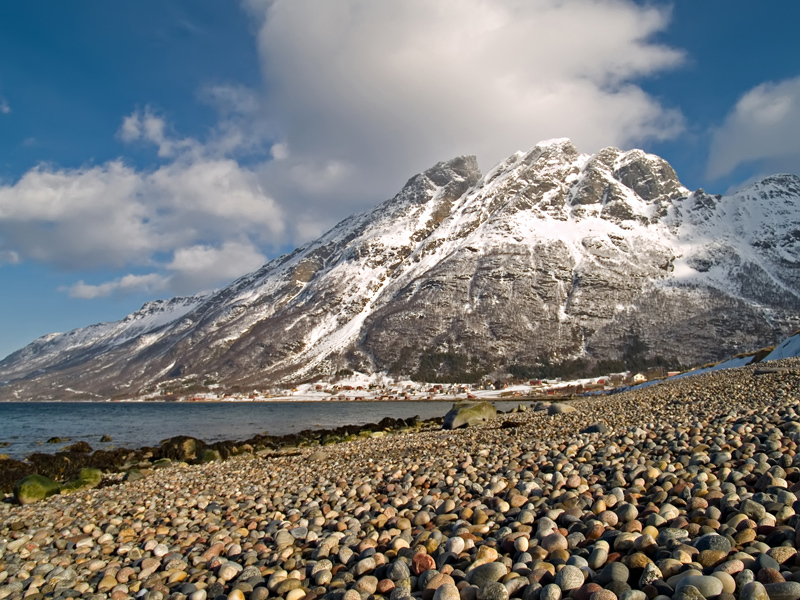 Wonderful picture of Norwegian nature and another good reason to take Huritigruten all the way! OMG! your pictures are amazing! Keep it up. Now it’s a good reason to own a good camera. ooooooo…nice photo, i will send you somes photos from my country, argentina, have you hear about it? is in south america and i can tell you that we have places as in your photo, too.